“Beep beep.” Coyote feels the adrenaline kick. His legs steady, eyes focus on the horizon. He looks left, then right. “Beep beep.” The roadrunner is getting closer. Coyote’s fingers are actually tingling. His mouth waters. He looks left, right. Left. Right. Can he actually hear the steamroller churn of the animal’s legs, or is his stupid body fooling him again? He has learned to distrust his eyes, his brain, the way the one sends messages and the other reads the signals. It is all ones and zeros, patterns and interpretation. Nothing is real. Run into a fake tunnel painted on a canyon wall once, he thinks, shame on me. Run into it a twenty-fourth or fiftieth time, and maybe we are all living in the Matrix. “Beep beep.” And still his body springs to the ready when the bird approaches. His legs are coiled. He looks left. He knows the sharp tips of his fangs have no nerve endings, but he swears he can feel an ache there, a muscle ready to be used. He looks right. There. The little dust cloud that trails the bird everywhere he goes. Even as Coyote sighs inwardly his body is gauging the distance and speed of the animal’s approach. His legs are moving, slow and then fast and then the roadrunner is on his side. “Beep beep.” Coyote finds himself in his usual position, watching the blur of the animals’ dinosaur feet, the pert muscled chapel of its posterior as it powers ahead toward…what or where he is not sure. He is never sure but he follows nevertheless. He relaxes for a moment, enjoys the animal strength of his body doing what it was meant to do. He lets his mind go blank, focuses on his breathing, the purposeful feel of his feet striking the asphalt. He is a coyote. He is hunting. He is chasing a roadrunner. He has tried meditation and has never really been able to let go, really surrender his grip on the present, shut off his brain and just be here now. This is as close as he will ever get, he knows, this right here: Coyote and roadrunner and running blindly toward the blank desert horizon. The animal breaks right and Coyote follows. The dust cloud kicks higher. Coyote refocuses. This is where he needs to be on his game. He has met humiliation in these canyons. He has met cruel fate and astounding trickery. He has had three knee replacements and two concussions. The last surgeon who operated on his nose warned that there was very little cartilage left to work with at all. He owes his dentist two paychecks’ worth of fang repair. The animal stops and Coyote stops as well. He waits, gauges the situation. The roadrunner stands still. Surely there is a trick coming, a pipe or an anvil or another optical illusion. 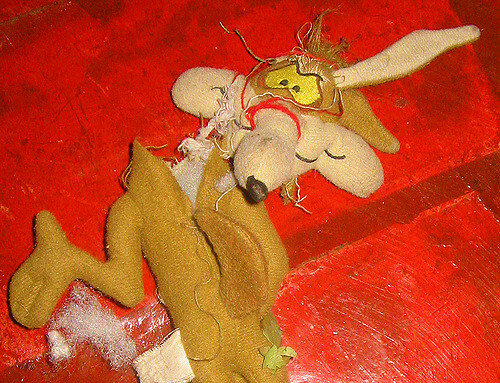 Coyote has finally learned to never accept a package that purports to be from the Acme Corporation. “Beep beep,” the animal says. Coyote wonders again why the roadrunner never speaks, if there is anything behind those big bright eyes. The roadrunner is smiling, always appears to be smiling. What does it say about Coyote that his one and only lifelong adversary has a vocabulary of one word? The animal takes off again and Coyote follows. He hates that he is running, chasing, following. He hates his legs, his lungs, his stupid eyes focusing perfectly on the blue blur in front of him, the dumb lizard brain that sends him pedaling after the roadrunner despite everything he has learned. His therapist thinks it has something to do with his mother. The roadrunner runs and Coyote follows. Up and down the canyon valley, over rocks and sand, past the green blur of cacti. They careen back onto the highway. In the distance, the orange sun sits like a soft boiled egg. Coyote is hungry, but hungry for what? He wants, but what does he want? Coyote can smell the roadrunner’s musk. The bird turns and grins. “Beep beep,” he says. They are headed for what appears to be a tunnel through the thick canyon walls. Coyote should stop. He. Should. Stop. The roadrunner flies through the entrance. Coyote knows he should pause and check the structure, put a paw up to the granite to see if it is real. He knows the quote about the definition of insanity. Coyote closes his eyes. His legs keep moving. Dave Housley’s fourth collection of short fiction, Massive Cleansing Fire, was published in 2017 by Outpost 19. His first novel, This Darkness Got to Give, is coming out in 2018 from Pandamoon Publishing. His work has appeared in Booth, Hobart, McSweeneys, Wigleaf, and some other places. He’s one of the founding editors and all-around do-stuff people at Barrelhouse. Sometimes he drinks boxed wine and tweets about the things on his television at @housleydave.